Yun Gee is “young” not only in the sense of avant-garde art, but also in age. He was born in Canton, today’s fervent political center, and has not yet attained maturity. It was only three years ago that he arrived from his home country to his adopted city, San Francisco; at that time he felt the urge that brought forth his own art. In San Francisco, he exhibited his paintings for the first time in the city’s Chinatown, and that is when he attracted the attention of artists and art lovers. He then gave another exhibition which earned him the praise of many art critics. 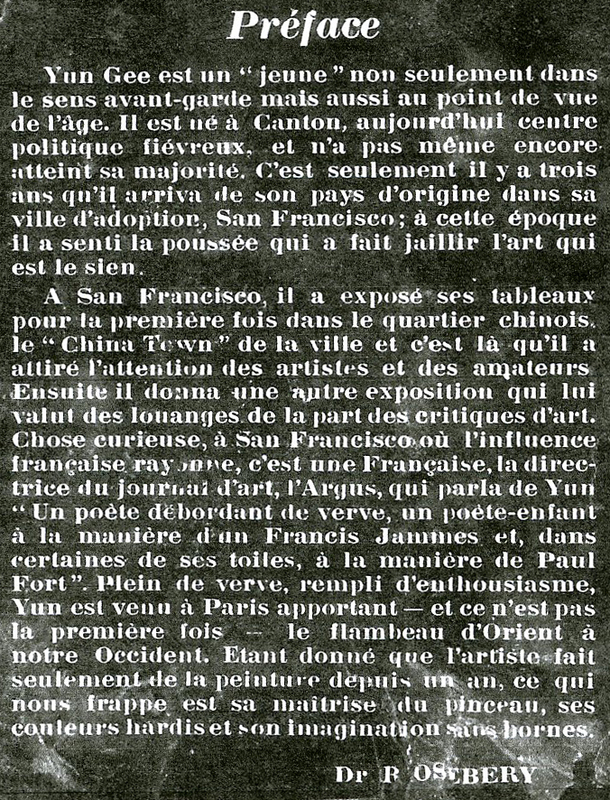 Curiously, in San Francisco where the French influence shines, it was the French editor of the art newspaper, The Argus, who said of Yun Gee “He is a poet with overflowing verve, a poet-child in the manner of a Francis Jammes and, in some of his paintings, in the manner of Paul Fort.” Full of vigor and enthusiasm, Yun came to Paris, bringing – and this is not the first time – the torch of the East to our West. Given that the artist has only been painting for a year, what strikes us is his mastery of the brush, his bold colors and boundless imagination.